since extension developers are not notified about comments on addons page (only about issues, also not possible to reply on comment) and many ppl asking questions in commenting section. So if you have question how, what... ask here. If you want to highlight this more, you can also fill in the "Support page" information about the extension to point to the URL of this thread. We generally wanted to direct people in the direction of reports rather than reviews for questions, but I guess we're slowly seeing that it's not changing that much. The review and report system will be overhauled at some point in the not so far future. or you were thinking about something else? if i use this in your extension it searches for %s instead of the selected text. How can i use it in your extension? Would like to see this feature: Text link -> select + drag (up or down) to open in backgrownd or foreground. So currently when i select/highlight a link and drag 'n' drop it searches for the selected/highlighted text. for now, if address is http://google.com (with protocol) DnD will open it. But without protocol, like google.com, it will just search for it... I could add some regex for recognizing if there is a www.something or .com or .net (or dot followed by two or three letters an slash, country domains) somewhere in selected text and based on that decide whether to open it or (if not) search for it. But those tests are never 100% sure. I misunderstood enshtein88 request. I love the extension. Before i had a macro set up on my keyboard to use a custom search engine, now i only have to dnd. 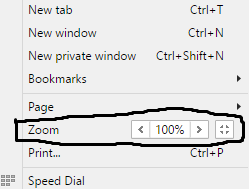 Would it be possible to add the native zoom option Opera to the context menu? you mean like adding it to Zoom popup menu or "real" right click menu? I meant the real one. Would have been nice.